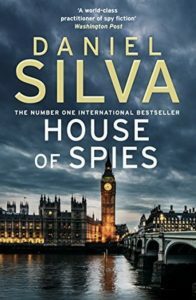 Daniel Silva’s latest book in the brilliant Gabriel Allon series takes up where “The Black Widow” left off, though you absolutely do not have to have read the former to enjoy the later. Gabriel, the thoroughly likeable, decent, honourable man who heads up the Israeli Secret Service has unfinished business with one of the most dangerous men on the planet, Saladin, whose network of terror spreads death and destruction all over the world. The novel opens with a vicious, well planned attack on London, and from there it is a matter of racing against time to find Saladin before he strikes again. With painstaking investigation, one loose thread in Saladin’s careful plot is discovered, unpicked and the combined brains and resources of the French, British, American and Israeli intelligence communities work frantically to locate the man who dispenses death with impunity. What is striking about this book is its bang-up-to-date-ness. 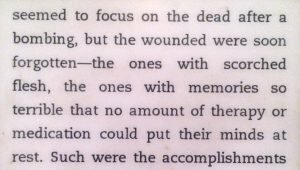 At times, you wonder if Mr, Silva isn’t writing about actual events, so contemporary and realistic are they. It is a sad reflection of our times that the line between fact and fiction is so impermeable, when it comes to the war on terror. The realistic contemporary plot makes this book even more nail-biting than Mr. Silva’s earlier books, each one of which is a study in keeping readers on the edge of their seats. Though there are many familiar characters in “House of Spies” there is less personal, family detail in this book, less of the daily life of Gabriel and Chiara in Jerusalem that we have come to enjoy in the books. The focus is solidly on Gabriel and his team, as they plot and plan their way through drug dealers and arms dealers and terrorists in a chase that takes us through Marseilles, Casablanca, and London. A gripping read, “House of Spies” seems more intense and a shade darker than some of the earlier books. There is no art, there is very little food and wine, almost as though the increased threat level from the likes of Saladin does not allow for relaxation. We meet new characters in this book who will play pivotal roles – Jean-Luc Martel and his partner Olivia Watson. The world of the uber rich, living a life of self-indulgent luxury on the French Riviera is laid bare for us, as the couple is drawn into the complicated trap being laid to locate the mysterious, shadowy Saladin. Well-written, with twists and turns right up until the final page, this is a cracker of a read. It is contemporary, it is disturbingly realistic and it makes the reader think about the state of the world we live in. If you would like to order the book, nothing could be simpler. Yes, indeed, I am still very immersed in the world of the master Israeli spy and assassin Gabriel Allon, and, as ever, am in awe of the amazingly topical plots and their totally unpredictable twists and turns, in the hands of the master, Daniel Silva. Gabriel Allon and his world have been my non-stop summer reading and to my horror, I have only one book in the series left to read, and am already going into depression at the thought. I started out in the early days of our brutal Delhi summer with Book 1, and have read them all, in order, finishing the excellent “The English Spy” just now, on a hot September afternoon here in Delhi. I said just now that the plots are topical. They are, of course. That goes without saying. But Mr. Silva seems to be prescient, too, and it is this uncanny ability to have his pulse not only on the contemporary world scene but also almost see into the future, that makes his books so riveting. “The English Spy” sees Gabriel Allon at work in Ireland, as he tries to defeat his old nemesis from earlier novels…but I really can’t tell you much more without being a complete spoil sport, so I won’t. One of the leitmotifs that run through this totally absorbing and clever series is that of art. Jewish Gabriel is an art restorer of world renown, one of the world’s top restorers of Christian art, often undertaking commissions directly for the Vatican and for the Catholic churches of his beloved Venice. This unlikely pairing of violence and art, of Judaism and Catholicism, of killing and healing, is just one of the clever devices Mr. Silva uses to weave stories that draw you into them on so many different levels. Sad to say, Israel and Israelis are often not the world’s favourite people, and so it is refreshing to be treated to the total decency and honesty and probity of Gabriel and his team. Speaking personally, here in India, we usually meet the aggressive young Israelis who flock to places like Ladakh and Himachal, and are, sadly, very often rude and unfriendly. Huge generalisation, I know, I know, but there were a couple of bruising encounters with hard-eyed unsmiling Israelis in Leh last time I was there. Sad. 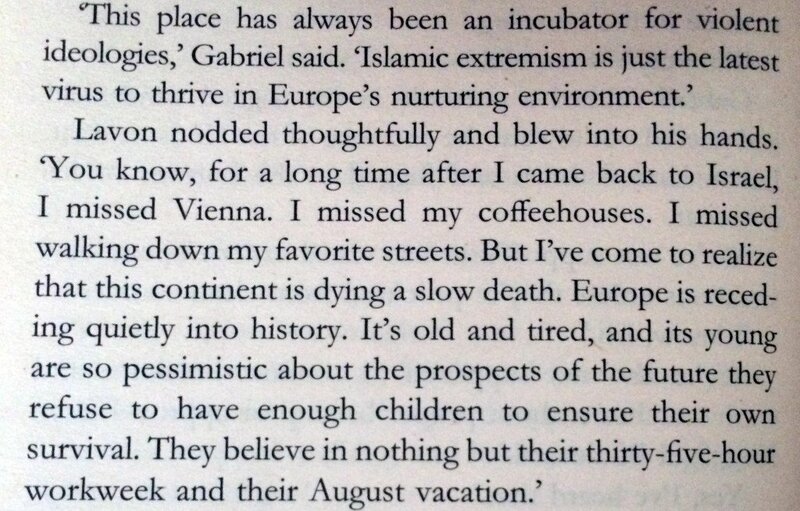 So, hopefully without sounding too naive, to immerse oneself in the world of Gabriel Allon, is to restore one’s faith in a country and its people. Everyone in Gabriel’s ambit is passionate about Israel, but without being overtly religious. The love for their country shines through, as does their commitment to making sure the world does not forget the horrors of the Holocaust. The sights and sounds and light of Israel, the food and the wine and the sunsets, the dangers and the fear and the constant threats are just one of the many joys of these books. And, as I said, they restore one’s view of the country and its people. My current politico-thriller writer of choice is Daniel Silva, creator of the Gabriel Allon series, which I have been rattling through at a cracking pace. The only trouble with a gripping series such as Mr. Silva’s books is that once started, you don’t pause for breath, nor (in my case) for time to review them. And so I have stopped reading for just long enough to share with you my thoughts on “The Secret Servant”, the 7th novel in this exciting series. Yup. Indeed. 6 books read, back to back, without pausing long enough to review them. Guilty as charged. What an interesting man Gabriel Allon is. A spy and and assassin for the Israeli secret service, Gabriel is Jewish without being overtly religious. He is Israeli, but a polyglot, at home in much of Europe. A talented art restorer, he is forever haunted by his own personal horrific backstory (don’t worry, no plot spoilers). In other words, an interesting, complex figure, but one who still manages to keep a veil of secrecy around him. 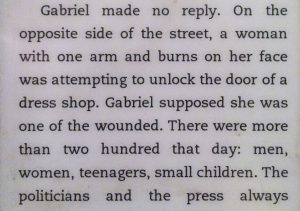 We, the reader, instinctively like Gabriel. We root for him, we worry about him, but yet we do not fully “know” him. Gabriel’s foe in many of the books is extreme Islam, and there is little point being politically correct or beating about the bush. What Gabriel and the Israeli secret service face seems to be a pretty fair representation of much of what is currently wrecking our world. Bombs aimed at innocent people, racking up the collateral damage that the hardline extremists we meet, seem to consider of no value whatsoever. Lives are expendable. It’s not that the world of Gabriel Allon and the decent, likeable towering figure of Ari Shamron unfairly represents the growing conflict between Judeo-Christianity and militant Islam. These books are not Israeli propaganda It isn’t like that at all. And yet…so many of the plots and terror threats that Gabriel has solved in the books thus far, involve the sort of terror threats that the world today increasingly faces. 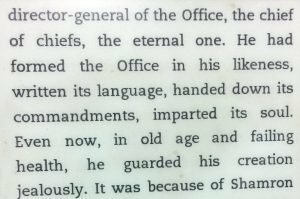 And “The Secret Servant” was written in 2007, for goodness sake. So much horror has happened since. Almost scarily prescient. Mr. Silva’s books could never be described as light or humorous or frothy. His stories are of terror and plots and spies and danger, of death and fear. And yet, I found this excellent novel “blacker” and gloomier than some of its predecessors. As we travel the road of counter-terrorism in the edgy company of the upright Gabriel, a killer with a very firm conscience and a deep awareness of the rights and wrongs of this world, we sense his growing weariness and occasional disenchantment. He is heading towards middle-age, he has faced dangers and torture far too many times, and he knows that his life will always be at risk. He has tackled so many terrorist outfits head-on that he has enemies galore. Like all its predecessors in this series, “The Secret Servant” is a gripping, often times gory and frightening, and, I must be frank, a disturbing picture of an alienated world. The old continent has never looked more vulnerable. This is a page-turner with a long-lasting message.